Most adults are unhappy with the appearance of their smiles. 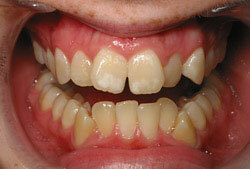 Crooked teeth make many people feel self-conscious, reserved, or even ashamed of their appearance. 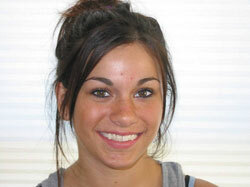 Now adults all can smile bigger and brighter than ever after wearing braces for only six months! At South Austin Dentist office of Dr. Tuan Pham, we offer Adult Cosmetic Braces AKA as Six Month Smiles or Fast Braces and we utilizes clear braces to gently straighten teeth in an average time of only six months! By focusing on the teeth that show when you smile and not making significant bite changes, we can comfortably straighten your teeth and give you the attractive, pleasant smile you’ve always wanted. For more information about Adult Cosmetic Clear Braces or Fast Braces, send us an email! Contact us today or call us at 512-301-2483 to schedule your new & beautiful straight smile! Please visit our Austin 6 Month Smiles website for more information about 6 month braces! By your next cleaning, you too can have the straight, beautiful teeth that you’ve always wanted. After – only 6 months later! Can you tell she’s wearing braces? Have a beautiful smile in only 6 months! A new smile by your next cleaning! A: As an adult, your back teeth are in a stable and comfortable position: you bite and chew without problems right? So why spend 2-3 years moving the back teeth around, when we can just focus on your front teeth and provide you with a great smile in 6 months! A: Since we’re moving teeth, it’s normal to feel some tightness and soreness for a few days. But Advil/Ibuprofen works wonders. The soreness should be much less than you recalled if you have had braces as a kid. Q: What about porcelain veneers? 1. You will not have irreversible drilling done to your teeth. 2. If you wear your retainer, braces never will have to be redone. 3. Costs much less. 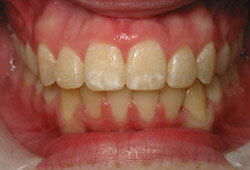 A full mouth make over with veneers would cost 3-5x what 6 month braces would! Q: Now what about Invisalign? A: Certainly if you are interested in Invisalign, Dr. Tuan Pham can help you out also. He is a certified Invisalign provider. If your priority is absolute clear braces and you don’t mind wearing them for 1 year, then Invisalign it is for you. However, if you want faster braces and more importantly, you don’t fall under the criteria for predictive movements with Invisalign, then we recommend 6 month braces for you. In any case, please call us at 512-301-2483 (BITE) for a free consultation, our contact our South Austin dentist team at our website.